Many have debated how the Legacy family tree arrangement would impact their Legacy benefits. William Wallace, a senior game designer at Bioware, has cleared up all the debate. 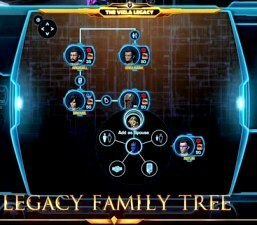 As he explains in his post, the arrangement of your Legacy characters has no positive or negative impact. So make your Trooper your son or have him be a rival as long as he is in your Legacy the benefits will apply. Once again Bioware is allowing you to play the game however you want to and allow it to be your story. Perhaps this just might help bring out the hidden role player in us all. Is this a good way to handle the Family tree arrangement? We would love to hear your opinions. My wife and I would like to be wife-husband in SWTOR but our main characters are on separate accounts. So my question is: is it possible to link characters on different accounts? If not, do they plan to implement it the near future? What a great question! That isn’t in the game so far, but it should be!